UNITED NATIONS, June 17, updated -- There is a cliche that the UN and most reporters at it are anti-Israel. (This is more than made up for by Israel's near 100% support rate in the US Congress). But Israel's Mission to the UN on June 17 raised the stake, either as a shift in policy or because its spokeswoman is said to be leaving her post in the near future. Mirit Cohen, a Mission staffer long in charge of choosing which journalists would be given the microphone at stakeouts by Netanyahu, Olmert and even Silvan Shalom, hauled off and wrote an angry letter to the UN reporters' club. They screened a film on June 10, shot on the flotilla. Mirit and the Mission asked to screen a counter film, which was immediately approved. But this was not enough, resulting in the protest letter below. The context here includes a recent briefing by Norman "This Time We Went Too Far" Finkelstein, skewered in a New Republic piece by a budding journalist ostensibly interning for a pro Group of 77 news service. The pro Israel reporters, in truth, are down to only three, one of whom lost his daily venue, and the third of which often falls asleep in the midst of briefings. One can sympathize with Mirit's frustration, but as one correspondent put it, lying is not the answer. Anti member state or one sided presentatiosn have a precedent in the UN. Peruvian candidate Toledo was allowed to hold forth in the North Lawn building, all the while filming himself denouncing Hugo Chavez for his own election. On the other hand, a film about the abuse of indigenous people in Laos was blocked by that country's mission. But does Israel want to be Laos? One wag mused that Israel might want to raise its game to that of North Korea, which after South Korea screened a video about the sinking of the Cheonan produced its Permanent Representative for an hour long press conference with an almost Catskills flavor. Previous Israeli Perm Rep Danny Gillerman might have burst into the flotilla screening. The current administration sends letters of complaint, to the UN itself, along with a broken link to its own video. Footnote: on for us a more positive note, the UN Correspondents Association's executive board on June 17 agreed to add the word "blogger" to the list of accredited media. [Insert obligatory full disclosure here.] It should not have had to be such a fight, but for now it seems the Blog-i-con appears to have been crossed. Ten years over due, the UN will step into the 21st Century. I write this letter of complaint to officially protest your mishandling of the events surrounding the screening of footage by Ms. Iara Lee on 9 June 2010 at United Nations Headquarters in New York. Offering UN media facilities to screen video produced by a one-sided activist while actively preventing a Member State of the United Nations an opportunity to respond in real time is severely unethical. 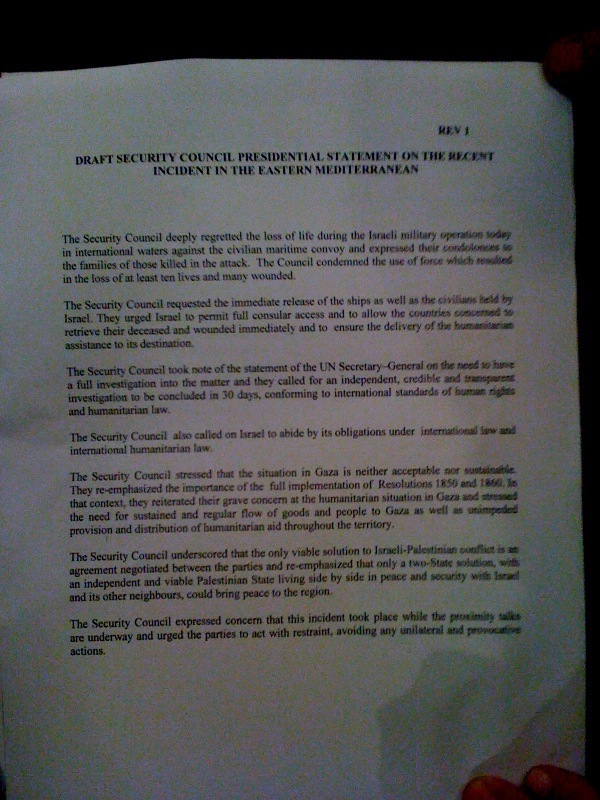 In the current circumstances, your decision to ban the Permanent Mission of Israel from offering any feedback or comment during the aforementioned screening ensured that the reporters invited to the event would be offered only part of the story rather than a more complete set of facts so that they themselves could have made an informed analysis of the events in question. Furthermore, the fact that you canceled the participation of the Permanent Mission of Israel only two hours prior to the commencement of the screening raises grave doubts as to the reasons behind this decision. 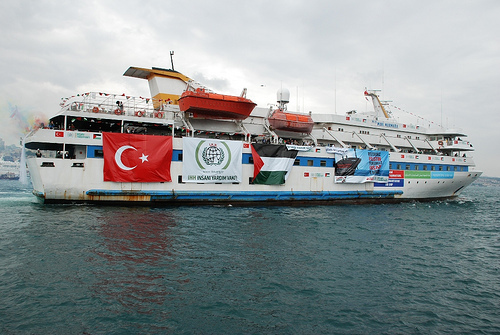 I have shared these concerns with you directly, though I believe that the members of the UN Correspondents Association deserve a more comprehensive set of facts regarding the events that took place onboard the Mavi Marmara on 31 May 2010. 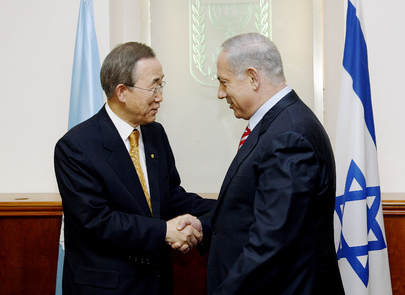 As such, I have decided to share with the members of UNCA the footage prepared by Israel. In conclusion, I certainly expect that you will look into the decision that led to Israel’s nonparticipation in the event on 9 June. Furthermore, I expect an official apology from you and your association regarding this mistake. I – along with fair-minded journalists – expect that you as the President of the United Nations Correspondents Association would exercise responsible journalistic practices and demonstrate a commitment to balanced and objective news. I write this letter of complaint to officially protest your mishandling of the events surrounding the screening of footage by Ms. Iara Lee on 9 June 2010 at United Nations Headquarters in New York. In conclusion, I certainly expect that you will look into the decision that led to Israel’s nonparticipation in the event on 9 June. Furthermore, I expect an official apology from you and your association regarding this mistake. I – along with fair-minded journalists – expect that you as the President of the United Nations Correspondents Association would exercise responsible journalistic practices and demonstrate a commitment to balanced and objective news. Your letter of protest came as a surprise to members of the United Nations Correspondents Association. It is factually incorrect and distorts the exchanges that took place on June 10 (not June 9) between UNCA and your mission. Instead it was you who turned down our offer to screen your Israeli film and make your statement directly before or after Ms. Lee's presentation, you who refused to take the stage alongside Ms. Lee to present your side of the story, you who declined to take questions from UNCA journalists -- a requirement for all UNCA presentations. UNCA sees no reason to apologize. UNCA Executive Committee members behaved fairly and professionally, offering both sides the chance to present their version of what happened on May 31. We wanted a balanced event but you were not willing to take part in one. Your approach to our organization was both undignified and unprofessional. If anyone is owned an apology it is the United Nations Correspondents Association. We hope to have better cooperation in the future based on mutual respect. That won't going to happen, I'm sorry. It's only five minutes that I insist to screen right after her film as a comment. If you won't allow it the Israeli mission will consider to send a formal letter of complaint to the SG and you should know that the Israeli press going to write about this saga.